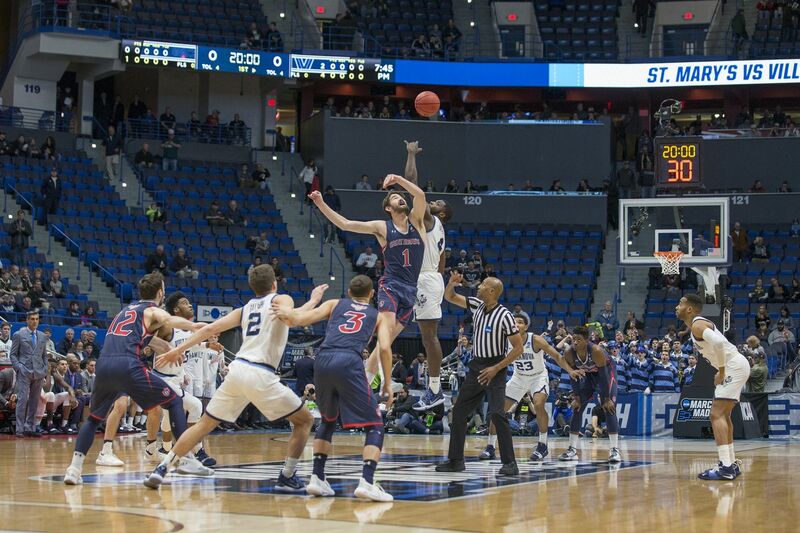 Because of the short turnaround between the afternoon and evening sessions, the game between Villanova and of St. Maryâ€™s started in a very empty arena at the XL Center in Hartford, CT on March 21, 2019. HARTFORD, Conn. – Phil Booth didn’t know what was going on. Villanova was preparing to take the court on Thursday night for the start of its first-round game in the NCAA Tournament against St. Mary’s, and there were barely a thousand people in XL Center. The afternoon session of Thursday’s games ended just before 7 p.m. Officials needed to get the spectators to exit and then allow ticketholders for the evening session to enter, but not before going through a scanner. Because of that, the arena was slow to fill to what would become a crowd of 14,695. Wildcats coach Jay Wright said he had been told by arena officials to expect a small crowd when the game tipped off. “It was great, because you talk to the players about what a great experience this is, how much they’re going to enjoy it,” he said. “There’s such a great vibe. Then I was thinking, ‘All right, they’re going to say this guy’s a liar.’ There’s nobody here. The game, originally scheduled to begin at 7:20 p.m., was delayed for 25 minutes. The second night game, between Purdue – the Wildcats’ second-round opponent – and Old Dominion, did not end until after midnight. Because of the short turnaround between the afternoon and evening sessions, the game between Villanova and of St. Mary’s started in a very empty arena at the XL Center in Hartford, CT on March 21, 2019. When a question was posed to Wright about the Wildcats’ problem with offensive rebounding against St. Mary’s, he corrected the questioner. “It was nonexistent,” he said. Villanova managed just five offensive rebounds and four second-chance points against the Gaels, its fourth single-digit output in its last six games. That poses a problem for Saturday night, because Purdue sports a plus-5.2 rebound advantage and grabs an average of 12.2 offensive rebounds. “We have to keep them off the glass,” the coach said. “Even their guards offensively rebound really well, which is rare. How we can get our guards to rebound against their guards is going to be important. Booth remembered his previous meeting with Purdue, on the road in the second game of the 2016-17 season. He scored seven points in a 79-76 ‘Nova win, but he would be shut down for the rest of the season after the next game, because of a knee injury.